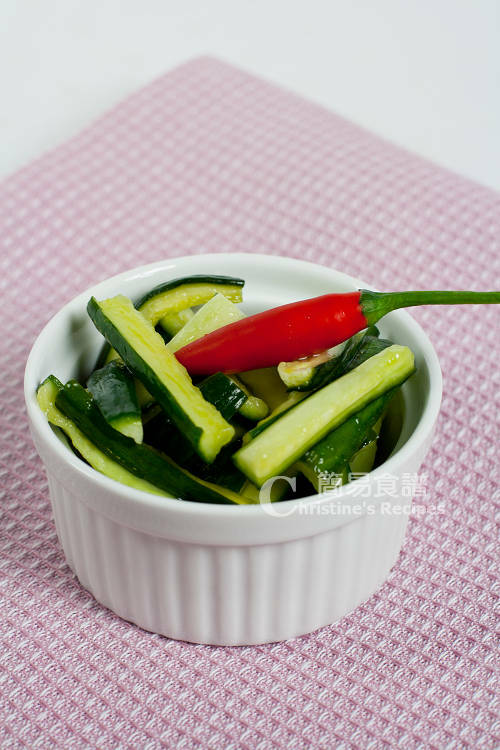 This dish, Sweet and Sour Cucumber is always served in Chinese restaurants as an appetizer, or a side dish, very refreshing and healthy. When you eat cucumbers raw, sometimes you might taste bitterness in the skin. The bitterness seems to vary from type to type of cucumbers, with different degree of bitterness from time to time. I learned a small trick from my mother-in-law to reduce or remove the unpleasant bitterness. The secret trick is pretty simple, just cut out both ends and use them to rub the cucumber. This method helps remove the white jelly-like substance from the skin. The more you rub, the more white substance you get, the better the cucumber tastes. This time I tried the Taiwanese cucumber (小黃瓜 Xiao Huanggua). The flesh is firmer with less water and seeds inside. It’s the best kind of cucumber to make this dish. If you can’t find any Taiwanese cucumbers, try Lebanese cucumbers. It’s also a good choice. Rinse cucumbers. Cut out both ends about 1cm. 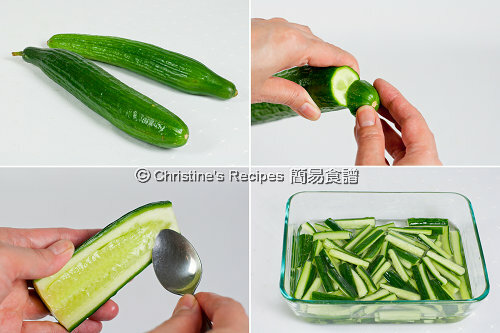 Use the two ends to rub the cucumber as the picture shown. Wipe clean. Cut the cucumber lengthwise. Spoon out the seeds, then cut into 3.5cmx0.5cm strips. Mix 1 teaspoon of salt with the cucumber for 10 to 15 minutes. Rinse thoroughly for 2 to 3 times. The last time, use cooled boiled water to rinse. Drain well and wipe dry with kitchen papers. Chill in fridge for about 20 minutes. Meanwhile, add vinegar and sugar in a stainless steel saucepan. Cook over medium-low heat, until sugar is completely dissolved. Remove from heat and let cool completely. Pour the vinegar and sugar mixture in a glass container, like Pyrex. 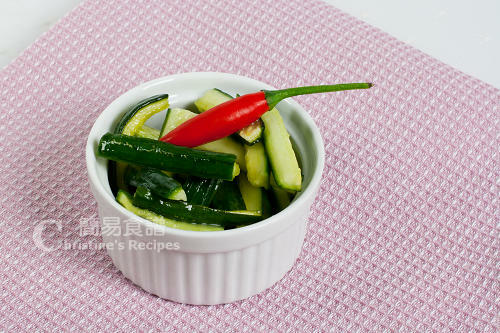 Remove the cucumber from fridge and transfer into the mixture, mix well. Chill in fridge for about 1 to 2 hours, covered. Served cold. Basically, the ratio of the vinegar and sugar used for making this dish is 1:1. Yet you can adjust the amount of vinegar or sugar to suit your personal taste. You might like to add sliced red chilli to add a kick when served. Oh thanks for the tips about making cucumbers not as bitter. I noticed the bitterness one day, but I wasn't really sure what taste it was at that time. I just thought that the cucumber tasted weird. This is a favorite dish of mine that my mom used to make pretty often, but now she doesn't so I almost forgot about this. I love this type of cucumber pickle. I always add pineapple and chopped chilies too. It goes very well with spicy or oily food. Wow...great tip on the cucumbers! I never knew that trick! Thanks! A quick and refreshing summer salad! I love cooking with cucumbers. This recipe looks great! I love this! In Indonesia, we call this acar. Usually, we add chopped chilie, shallot, carrot or pineaple. Everytime, we eat noodle or fried rice or sate. Acar always comes along. I love cucumber pickle. I call it acar... so refreshing and goes well with spicy foods. Oooh, acar! I made this some time ago (but mine includes pineapple and onions)! Your post just reminded me to make some more. It looks so refreshing! I love pickle! This recipe looks so tempting and easy. Must try soon. awesome! been craving this since having something similar @ Din Tai Fung! gonna try this out, cheers! hi Christine, i in love with ur blog! may i check what you mean of a cup of sugar? sugar that already mixed with water of just fully sugar? how much ml is your cup means? thanks alot! I have put the measurements used for my recipes on the sidebar of this blog. As for this recipe, just measure the sugar with a cup (250ml). Hey Christine! Thank you for posting all these recipes! I just made the beancurd puffs with daikon and carrots and loved every bite of it! Quick question as I'm a little confused by the description, did you rub the whole outside of the cucumber with the ends? Thanks again! If I want to make a big jar (eg 1 liter) full with veggies (cucumber/carrots/raddish etc) do I just double the amount of vinegar/sugar/salt? You can use this method to make pickled carrots and radish. Very yummy. Increase all the ingredients proportionally, double or triple, if you use a larger jar. Hi Christine! This recipe reminds me a lot of what my mom makes every once in a while for Chines brunch. :) We make this cucumber with seaweed and minced garlic to add a little kick. I love this recipe and loving the chinese words as well. :) I'm linking this recipe on my blog post.. it's such a great recipe and resource. Thank you for posting! Thanks for your link love. Love your idea of adding seaweed. A more healthy side dish.